Revelation 22:7: “Behold, I come quickly: blessed is he that keepeth the sayings of the prophecy of this book.” The book of Revelation. All praises to the Most High and Jesus Christ, for bringing us together in the spirit of love, respect, study, and fellowship. Throughout our journey we have found that there are many liars and deceivers (false prophets, teachers, and preachers) in the world. This includes the so-called churches and Israelites groups! This web site is set up to document our progress in the understanding of the word of God and the testimony of Jesus Christ found throughout the Bible. It should be noted that we questioned every doctrine that we were ever taught. We prayed, and reread the Bible a number of times in order to prove what was right, and/or wrong according to the scriptures. For this web site we are obeying the words of Christ, as written in Revelation 1:3, and concentrating our studies on the book of Revelation. Additionally, and in accordance with irrefutable scriptures, under Christ the 12 Tribes of Israel/the Children of God are from all nations! This is the fulfillment of God’s promise/covenant to Abraham, see Mystery Of The Kingdom Of Heaven. We invite you to follow our development, and study this web site. In so doing, you will find scriptural proof that you have been deceived. Lord's will, we will continuously read, study, and update this web site in accordance with the knowledge received from above. That the generation/people who lived during the time period of Christ and his Disciples, would be brought back to live again in the last day before Christ returns. 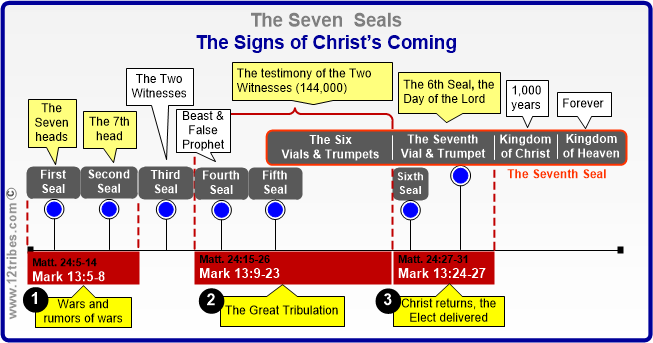 In Matthew 24, Mark 13 and Luke 21 Christ explains to Peter, James, John and Andrew, the signs/prophesies that will occur in the earth before his return. 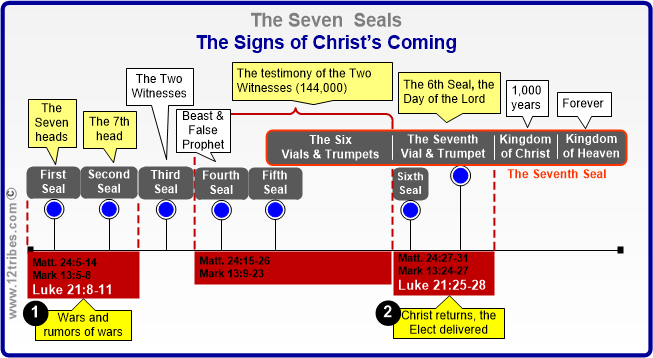 The aforementioned signs/prophesies coincide with the prophecies found in the book sealed with seven seals, see Revelation 5:1-2, 5 and Revelation 6:1. Additionally, he instructs them of the perils that will befall them during their ministries. He explains that the same generation, in their time period, will be brought back in the last day before his return, see Matthew 24:34. Matthew and Marks’ writings focus on the end times/last day. However, Luke’s writings include the time periods of the disciple’s ministry and the last day. Please note: This report (Matthew 24, Mark 13, and Luke 21) will concentrate on the prophecies concerning Christ’s return/the last day, these prophecies are also written in the book of Revelation. Matthew 24:1: “And Jesus went out, and departed from the temple:” [The temple located in Jerusalem that was destroyed by the Romans in 70 A.D.] “and his” [Jesus'] “disciples came to him for to shew him the buildings of the temple.” The physical appearance of the temple and surrounding buildings. Matthew 24:2: “And Jesus said unto them, See ye not all these things?” [Everything pertaining to the temple, including the surrounding buildings] “verily I” [Jesus] “say unto you,” [The disciples] “There shall not be left here one stone upon another, that shall not be thrown down.” The Great Earthquake/The Day of the Lord, see Isaiah 13:9-10, 13 and Revelation 6:12. Matthew 24:3: “And as he” [Jesus] “sat upon the mount of Olives, the disciples" [Peter, James, John and Andrew, see Mark 13:3] "came unto him privately, saying, Tell us, when shall these things be?" [The Great Earthquake/The Day of the Lord, answered in verse 36] "and what shall be the sign of thy coming, and of the end of the world?” Answered in Matthew 24:29-30 and Luke 21:25-27. Matthew 24:7: “For nation shall rise against nation, and kingdom against kingdom: and there shall be famines, and pestilences, and earthquakes, in divers places.” See 2 Esdras 11:1, 3 and 2 Esdras 12:21-28. Matthew 24:9: “Then shall they” [The deceived, see verse 5] “deliver you up to be afflicted, and shall kill you: and ye shall be hated of all nations for my name's sake.” See Mark 13:9-11. Matthew 24:10: “And then shall many" [The deceived] "be offended,” [Of the testimony of the 144,000, see Revelation 12:11 and Revelation 14:5-6] “and shall betray one another, and shall hate one another.” See Mark 13:12 and Revelation 13:7-8. Matthew 24:11: “And many false prophets shall rise, and shall deceive many.” See Revelation 17:12-14. Matthew 24:12: “And because iniquity" [Sin] "shall abound, the love of many shall wax cold.” See verse 10. Matthew 24:13: “But he” [The Elect] “that shall endure unto the end," [The Great Earthquake/The Day of the Lord] "the same shall be saved.” See verse 31. Matthew 24:14: “And this gospel of the kingdom shall be preached" [By the 144,000] "in all the world” [To all nations/kingdoms who teach and follow false doctrine; i.e. Islam, Hinduism, Buddhism, Atheist etc., and all (Churches and Israelite groups) that add and/or take away from the words of Christ, see Proverbs 30:5-6, Matthew 5:19 and 2 Peter 2:1-3] “for a witness unto all nations; and then shall the end come.” See Mark 13:24-27. Matthew 24:15: “When ye” [Peter, James, John and Andrew raised up again in the last day] “therefore shall see the abomination of desolation,” [See Revelation 13:15] “spoken of by Daniel the prophet,” [See Daniel 12:10-11] “stand in the holy place,” [Jerusalem] “(whoso readeth, let him understand)” The words written in verses 15-22 are “dark sayings,” see Psalms 49:4. These “dark sayings” are prophesies concerning the Great Tribulation which shall take place during the reign of the Beast whose deadly wound was healed and the False Prophet, see Daniel 12:1 and Message to reader: The Period of Great Tribulation (3 ½ Years). Matthew 24:16: “Then let them” [The 144,000 and the Elect] “which be in Judaea flee into the mountains:” See Revelation 12:13-14. Matthew 24:21: “For then shall be great tribulation, such as was not since the beginning of the world to this time, no, nor ever shall be.” See Daniel 7:21, Daniel 12:1 and Revelation 13:7. Matthew 24:25: “Behold, I have told you before.” See Mark 13:23. Matthew 24:27: “For as the lightning cometh out of the east, and shineth even unto the west; so shall also the coming of the Son of man be.” See Revelation 1:7. Matthew 24:28: “For wheresoever the carcase is, there will the eagles be gathered together.” See Revelation 19:11, 17-18, 21. 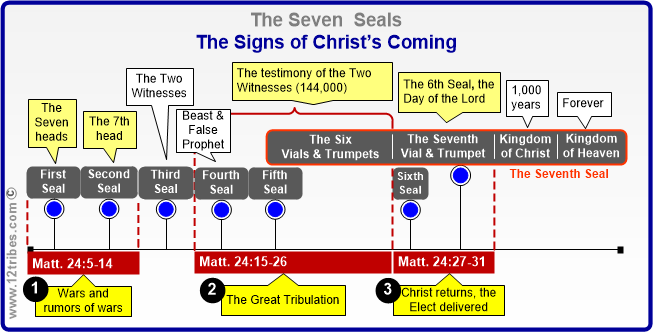 The Sixth Seal (Revelation 6:12), The Seventh Vial (Revelation 16:17-18) and The Seventh Trumpet (Revelation 11:15), will occur on The Day of the Lord. All nations/people will see the fierce anger of the Lord, and the Lord will destroy the sinners out of the earth, see Isaiah 13:9. The following events will take place on that great and terrible day! Matthew 24:29: “Immediately after the tribulation of those days" [See Revelation 11:7, 11-12] "shall the sun be darkened, and the moon shall not give her light, and the stars shall fall from heaven, and the powers of the heavens shall be shaken:” See Revelation 11:15, 19, Luke 21:25-26, Mark 13:25, and Revelation 6:12-15. Matthew 24:31: “And he” [Christ] “shall send his angels with a great sound of a trumpet, and they shall gather together his elect from the four winds, from one end of heaven to the other.” See Ezekiel 34:11-12, Mark 13:27 and 1 Thessalonians 4:16-17. Matthew 24:34: “Verily” [Truthfully] “I” [Christ] “say unto you,” [Peter, James, John and Andrew] “This generation” [The same generation/people that lived during the time of Christ and his disciples] “shall not pass,” [Depart] “till all these things" [Prophecies] "be fulfilled.” The same generation/people will be on earth to fulfill these prophesies; they will be brought back, before Christ returns, see John 6:39-40, Daniel 12:2 and Revelation 1:7. Matthew 24:35: “Heaven and earth shall pass away,” [See Isaiah 65:17, 2 Peters 3:10-13 and Revelation 21:1] “but my words shall not pass away.” See Isaiah 40:8 and 1 Peter 1:25. Matthew 24:36: “But of that day” [The exact day (The Great Earthquake/The Day of the Lord)] “and hour” [The exact hour] “knoweth no man, no, not the angels of heaven, but my Father” [The Most High] “only.” It is important to note: Peter, James, John and Andrew will know the season of the coming of Christ, see Luke 21:28 and 1 Thessalonians 5:1-6. Matthew 24:37: “But as the days of Noah were,” [See Genesis 6:11-13] “so shall also the coming of the Son of man be.” Explained in verses 38-41. Matthew 24:39: “And knew not until the flood came, and took them all away; so shall also the coming of the Son of man be.” See 2 Esdras 13:29-30. In the days leading up to Christ’s return, the wicked shall not understand the teachings of the 144,000, and shall be destroyed, see Daniel 12:10. Matthew 24:40: “Then” [When Christ returns/The Day of the Lord] “shall two be in the field; the one shall be taken,” [See verse 31] “and the other left.” See verse 30. Matthew 24:41: “Two women shall be grinding” [or working] “at the mill; the one shall be taken,” [See verse 31] “and the other left.” See verse 30. Matthew 24:42: “Watch therefore:” [Watch/understand and obey Christ, as Noah obeyed the Most High] “for ye” [Peter, James, John and Andrew] “know not what hour your Lord doth come.” See Matthew 24:36. Matthew 24:45: “Who then is a faithful and wise servant,” [See Revelation 1:1, 3 and Revelation 12:11] “whom his lord hath made ruler over his household, to give them meat in due season?” See Revelation 2:26-28. Matthew 24:46: “Blessed is that servant, whom his lord when he cometh shall find so doing.” See verses 9-10, 12-13 and Revelation 6:9-11. Matthew 24:47: “Verily” [Truthfully] “I” [Christ] “say unto you,” [Peter, James, John and Andrew] “That he” [Christ] “shall make him” [That wise servant, see verse 45] “ruler over all his goods.” See Luke 21:36, 2 Esdras 2:42-47 and Revelation 20:4. Matthew 24:48: “But and if that evil servant shall say in his heart, My lord delayeth his coming;” See 2 Corinthians 4:3-4. Matthew 24:49: “And shall begin to smite his fellowservants, and to eat and drink with the drunken;” See verses 9-12 and Luke 21:34-35. Matthew 24:50: “The lord of that servant shall come in a day when he looketh not for him, and in an hour that he is not aware of,” See verses 37-39. Matthew 24:51: “And shall cut him asunder, and appoint him” [That evil servant, see verse 48] “his portion with the hypocrites: there shall be weeping and gnashing of teeth.” See Luke 21:34-36, 2 Thessalonians 2:10-12 and Revelation 20:14-15. Mark 13:1: “And as he” [Christ] “went out of the temple,” [The temple located in Jerusalem that was destroyed by the Romans in 70 A.D.] “one of his disciples saith unto him, Master, see what manner of stones and what buildings are here!” In Jerusalem, surrounding the temple. Mark 13:2: “And Jesus answering said unto him, Seest thou these great buildings? there shall not be left one stone upon another, that shall not be thrown down.” The Great Earthquake/The Day of the Lord, see Isaiah 13:9-10, 13 and Revelation 6:12. Mark 13:4: “Tell us,” [Peter, James, John and Andrew] “when shall these things be?” [The Great Earthquake/The Day of the Lord, answered in verse 32] “and what shall be the sign when all these things shall be fulfilled?” Answered in Mark 13:24-26 and Luke 21:25-27. Mark 13:9: “But take heed to yourselves: for they" [The deceived, see verse 6] "shall deliver you” [Peter, James, John and Andrew] “up to councils; and in the synagogues ye shall be beaten: and ye shall be brought before rulers and kings for my sake, for a testimony against them.” See Revelation 10:8-11. Mark 13:10: “And the gospel must first be published among all nations.” See Revelation 12:11, Revelation 14:6 and Matthew 24:14. Mark 13:12: “Now the brother shall betray the brother to death, and the father the son; and children shall rise up against their parents, and shall cause them to be put to death.” See Matthews 24:9-10, 12. Mark 13:13: “And ye” [Peter, James, John and Andrew] “shall be hated of all men" [The deceived] "for my name's sake:” [See Revelation 13:7-8] “but he” [The Elect] “that shall endure unto the end, the same shall be saved.” Delivered, see Matthew 24:31 and verse 27. Mark 13:14: “But when ye” [Peter, James, John and Andrew] “shall see the abomination of desolation,” [See Revelation 13:15] “spoken of by Daniel the prophet,” [See Daniel 12:10-11] “standing where it ought not,” [Jerusalem] “(let him that readeth understand,)” [The words written in verses 14-20 are “dark sayings,” see Psalms 49:4. These “dark sayings” are the days of The Great Tribulation, see Daniel 12:1 and Message to reader: The Period of Great Tribulation (3 ½ Years)] “then let them” [The followers of Christ living during that time period; the kingdom of the Beast whose deadly wound was healed and the False Prophet] “that be in Judaea flee to the mountains:” See Revelation 12:13-14. Mark 13:19: “For in those days shall be affliction, such as was not from the beginning of the creation which God created unto this time, neither shall be.” See Daniel 12:1 and Matthew 24:21. Mark 13:20: “And except that the Lord had shortened those days,” [The days of the Great Tribulation] “no flesh should be saved: but for the elect's sake, whom he hath chosen, he” [The Most High] “hath shortened the days.” The period of the Great Tribulation, see Matthews 24:22. Mark 13:22: “For false Christs and false prophets shall rise, and shall shew signs and wonders, to seduce, if it were possible, even the elect.” See Revelation 13:11-14 and Revelation 17:12-13. Mark 13:23: “But take ye” [Peter, James, John and Andrew] “heed:" [Know this/understand/be warned] "behold, I" [Christ] "have foretold you all things.” The prophesies concerning the last day/Christ's return, see Matthew 24:4-51, Mark 13:5-37 and Luke 21:8-11, 25-38. Mark 13:25: “And the stars of heaven shall fall, and the powers that are in heaven shall be shaken.” See Matthew 24:29, Luke 21:25-26, Revelation 6:12 and Revelation 16:17-18. Mark 13:26: “And then shall they see the Son of man coming in the clouds with great power and glory.” See Revelation 1:7 and Revelation 14:9-10, 17-20. Mark 13:27: “And then shall he” [Christ] “send his angels, and shall gather together his elect from the four winds, from the uttermost part of the earth to the uttermost part of heaven.” See Ezekiel 34:11-12, Matthew 24:31 and 1 Thessalonians 4:16-17. Mark 13:30: “Verily” [Truthfully] “I” [Christ] “say unto you,” [Peter, James, John and Andrew] “that this generation” [The same generation/people that lived during the time of Christ and his disciples] “shall not pass,” [Depart] “till all these things" [Prophecies] "be done.” The same generation/people will be on earth to fulfill these prophesies; they will be brought back, before Christ returns, see John 6:39-40, Daniel 12:2 and Revelation 1:7. Mark 13:31: “Heaven and earth shall pass away:” [See Isaiah 65:17, 2 Peters 3:10-13 and Revelation 21:1] “but my words shall not pass away.” See Isaiah 40:8 and 1 Peter 1:25. Mark 13:33: “Take ye heed," [Know this/understand/be warned] "watch and pray: for ye” [Peter, James, John and Andrew] “know not when the time" [The Great Earthquake/The Day of the Lord] "is.” It is important to note: Peter, James, John and Andrew will know the season of the coming of Christ, see Luke 21:28 and 1 Thessalonians 5:1-6. Mark 13:34: “For the Son of Man is as a man taking a far journey," [See Acts 1:9-11 and Hebrews 8:1] "who left his house, and gave authority to his servants, and to every man his work, and commanded the porter" [Caretakers/Leaders/Teachers] "to watch.” See Matthew 24:42-44 and Luke 21:34-36. Mark 13:35: “Watch ye therefore:" [Watch/understand and obey Christ] "for ye” [Peter, James, John and Andrew] “know not when the master of the house cometh," [Christ] "at even, or at midnight, or at the cockcrowing, or in the morning:" See Matthew 24:36. Mark 13:36: “Lest coming suddenly he" [Christ] "find you sleeping." See Matthew 24:48-51. Luke 21:5: “And as some spake of the temple," [The temple located in Jerusalem that was destroyed by the Romans] "how it was adorned with goodly stones and gifts, he” [Christ] “said,"
Luke 21:6: “As for these things" [The temple adorned with goodly stones] "which ye” [The disciples] “behold, the days will come, in the which there shall not be left one stone upon another, that shall not be thrown down.” The Great Earthquake/The Day of the Lord, see Isaiah 13:9-10, 13 and Revelation 16:18. Luke 21:7: “And they” [Peter, James, John and Andrew] “asked him,” [Christ] “saying, Master, but when shall these things be?" [The Great Earthquake/The Day of the Lord, see Matthew 24:36] "and what sign will there be when these things shall come to pass?” Answered in Matthew 24:29-30 and Luke 21:25-27. Luke 21:10: “Then said he” [Christ] “unto them,” [Peter, James, John and Andrew] “Nation shall rise against nation, and kingdom against kingdom:” See 2 Esdras 11:1, 3 and 2 Esdras 12:21-28. As explained in the Message to reader: Matthew, Mark and Luke, the writings of Luke focus on both, the signs/prophesies concerning the disciples’ after the resurrection of Christ (Verses 12-24), and the signs/prophesies concerning the last day (Verses 5-11, 25-27). Verses 12-24 omitted intentionally, they can be read and studied as a pop up or print. Luke 21:26: “Men's hearts failing them for fear, and for looking after those things which are coming on the earth: for the powers of heaven shall be shaken.” See Isaiah 13:9-10, 13. Luke 21:27: “And then shall they see the Son of man coming in a cloud with power and great glory.” See Revelation 1:7 and Revelation 19:11-15. Luke 21:32: “Verily” [Truthfully] “I” [Christ] “say unto you,” [Peter, James, John and Andrew] “This generation” [The same generation/people that lived during the time of Christ and his disciples] “shall not pass away,” [Depart] “till all be fulfilled.” The same generation/people will be on earth to fulfill these prophesies; they will be brought back, before Christ returns, see John 6:39-40, Daniel 12:2 and Revelation 1:7. Luke 21:33: “Heaven and earth shall pass away:” [See Isaiah 65:17, 2 Peters 3:10-13 and Revelation 21:1] “but my words shall not pass away.” See Isaiah 40:8 and 1 Peter 1:25. Luke 21:34: “And take heed" [Know this/understand/be warned] "to yourselves, lest at any time your hearts be overcharged with surfeiting, and drunkenness, and cares of this life, and so that day come upon you unawares.” See Matthew 24:48-51. Luke 21:35: “For as a snare" [Trap] "shall it" [The Great Earthquake/The Day of the Lord] "come on all them that dwell on the face of the whole earth.” See Revelation 14:9-11. Luke 21:36: “Watch ye therefore,” [Watch/understand and obey Christ] “and pray always, that ye” [Peter, James, John and Andrew] “may be accounted worthy to escape all these things" [Prophesies] "that shall come to pass, and to stand before the Son of man.” See Matthew 24:45-47.